Currents in circuits with pure resistive, capacitive or inductive loads. A phasor is a complex number expressed in polar form consisting of a magnitude equal to the peak amplitude of the sinusoidal signal and a phase angle equal to the phase shift of the sinusoidal signal with reference to a cosine signal. Note that the specific angular frequency - ω - is not explicitly used in the phasor expression. Currents in circuits with pure resistive, capacitive or inductive loads are indicated in the figure above. The current in a "real" circuit with resistive, inductive and capacitive loads are indicated in the figure below. Note that the frequency of most AC systems are fixed - like 60 Hz in North America and 50 Hz in most of the rest of the world. For a resistance load in an AC circuit the voltage is in phase with the current. For an inductive load the current in an AC circuit is π/2 (90o) phase after the voltage (or voltage before the current). For a capacitive load the current in an AC circuit leads the voltage by π/2 (90o) phase. In a real electrical circuit there is a mix of resistive, capacitive and inductive loads with a voltage/current phase shift in the range -π/2 <= φ <= π/2 as illustrated in the figure below. The current in a "real" circuit with a mix of resistive, inductive and capacitive loads. φ is the phase angle between the current and the voltage. The impedance in an AC circuit can be regarded as complex resistance. The impedance acts as a frequency dependent resistor where the resistance is a function of the frequency of the sinusoidal excitation. The RMS value is the effective value of a sinusoidal voltage or current. AC voltmeters and ammeters shows the RMS value of the voltage or current - or 0.707 times the max peak values. The max peak values are 1.41 times the voltmeter values. 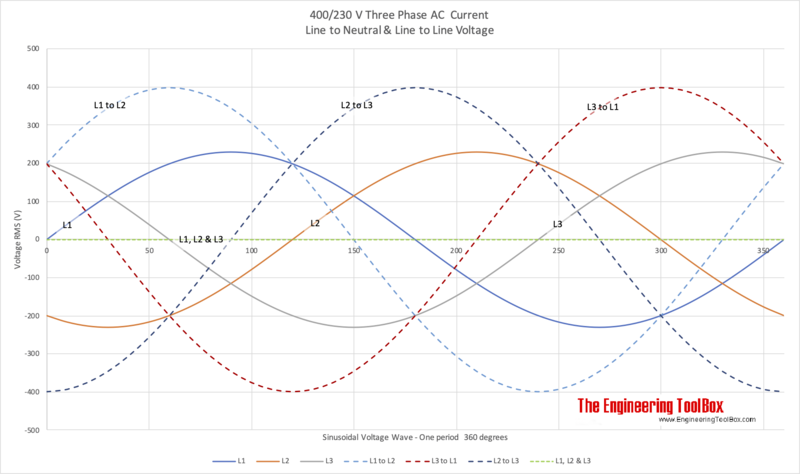 In an AC three phase system the voltage can be delivered between the lines and the neutral (phase potential), or between the lines (line potential). 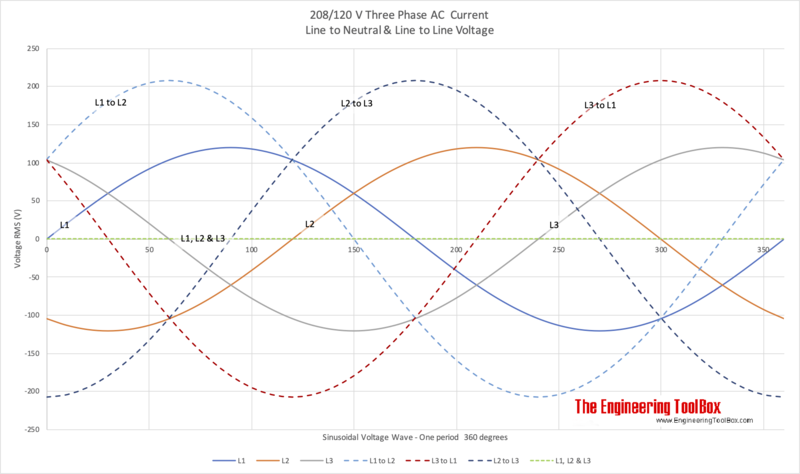 The resulting voltages for two common systems - the European 400/230V and the North American 208/120V system are indicated for one period in the figures below. The magnitude of the line potentials is equal to 31/2 (1.73) the magnitude of the phase potential. Cos φ is also called the Power Factor. Engineering ToolBox, (2016). AC Circuit - Voltage, Current and Power. [online] Available at: https://www.engineeringtoolbox.com/ac-circuit-d_1933.html [Accessed Day Mo. Year].